When I was a kid in the 1950s, a 300-foot-high circular metal cage loomed over the Six Corners shopping center. Technically, the structure was referred to as a gas holder. We simply called it the giant gas tank. The tank was used for storing natural gas. At one time there were dozens of them scattered about the city and suburbs. The biggest one was located near Kedzie and Pratt. Built in 1926, it was 362 feet high, 254 feet in diameter, and held over 15 million cubic feet of natural gas. The giant gas tanks could be found throughout the world. In some countries they were known as gasometers. Here in America, they were most prominent in St. Louis — one reason the 1930s Cardinals were nicknamed The Gas House Gang. My friends and I were always a little bit wary of the giant gas tanks. We’d seen the movie White Heat, in which Jimmy Cagney meets his end in a colossal explosion atop an industrial fuel tank. It didn’t matter that Cagney had been at an oil refinery, and not on a natural gas tank. It didn’t matter that Peoples Gas assured us their tanks were totally safe. Where was Smokey the Bear when you needed him? But by this time, the giant gas tanks were on their way out. Storing the gas in underground tanks was easier and cheaper — safer, too. 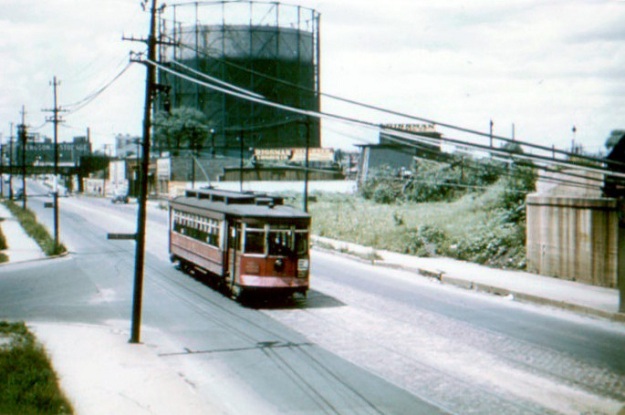 The last Chicago-area tanks were dismantled during the 1980s. Yet the memory remains. Every once in a while, I’ll find one in old pictures—near North and Clybourn, or Oakton and McCormick, or 95th and South Chicago. When I play episodes of the classic M-Squad TV show, there’s a gas tank a few blocks up Racine Avenue from the police station. And if I really need a nostalgia fix, I can always go to Vienna. Not Vienna, Ill. — Vienna, Austria. 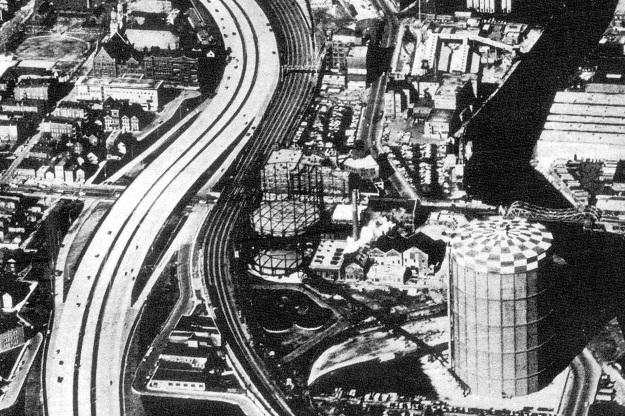 There they’ve converted four giant gas tanks into Gasometer City, complete with apartments, a concert hall and a shopping mall. Is it too late to rebuild the Six Corners gas tank?